My latest novel, Buying Time, is out now from Solaris. ‘No man in rich enough to buy back his past’ – Oscar Wilde. In January 2017, something very strange happens to screen-writer Ed Richie. He wakes up one morning to find that he has been shunted back in time nine months and is now inhabiting the body of his younger self… Worse is to come: the following day he time-jumps three years, to 2013, with all his memories of the intervening years in tact. What is happening to him? Is he going mad? And where will his involuntary time-travel end? 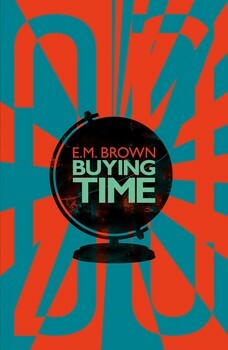 Buying Time is a time-travel novel like no other. No man is rich enough to buy back his past – unless that man is Ed Richie. I just finished Buying Time, and thought it was terrific, in my humble opinion your best novel yet. Thanks. May I ask: why the transition to EM Brown? Hi, and thanks for your kind comments. I’m delighted you liked Buying Time. As for why E M Brown…? It was the idea of my publisher, and the suggestion was that it might create a bit of interest and perhaps attract more women readers. We’ll see. I think it’s the best thing I’ve written since The Kings of Eternity. It seems to be garnering decent reviews. Cheers.